Heat gas grill or coals. In small bowl, mix apricot preserves, chili sauce and salt. Reserve 2 tablespoons; set aside. When ready to grill, place drumsticks on gas grill over medium-high heat or on charcoal grill over medium-high coals. Cook 20 to 30 minutes or until juice of chicken is clear when thickest part is cut to bone (180°F), turning chicken occasionally and brushing with apricot mixture during last 10 minutes of cooking. Meanwhile, cut two 12x12-inch pieces of heavy-duty foil. Place vegetable mixture in center of 1 piece of foil. Top with reserved 2 tablespoons apricot mixture. Top with remaining piece of foil. Seal packet securely on all sides, allowing room for heat expansion. Place packet on grill. Cook 10 to 15 minutes or until vegetables are tender. Open vegetable packet carefully to allow steam to escape. 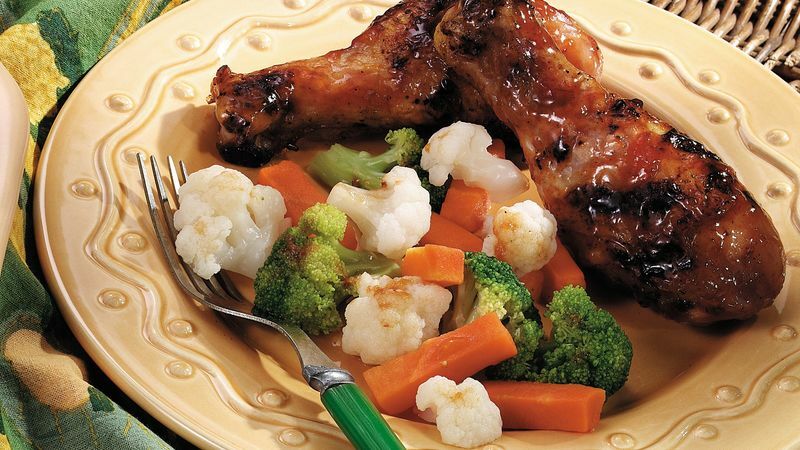 Serve vegetables with chicken.